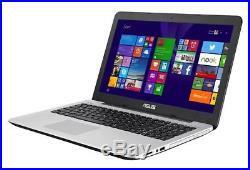 Asus X555LA-XX290H 15.6 Inch Laptop Windows 8.1 Operating System 4GB RAM 1TB HDD. Windows 8.1 Operating System. 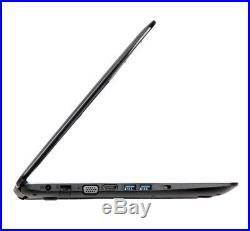 The Asus X555LA-XX290H 15.6 inch Laptops Intel Core i3 processor is outstanding for day to day uses including office work and home play. The dual cores are able to effortlessly multi-task without breaking a sweat so you truly can do more than two things at once with the Asus X555LA-XX290H 15.6 inch Laptop. The Asus X555LA-XX290H 15.6 inch Laptop also features a massive 1TB hard disc which means you can store all of your digital media such as photos, videos and music with ease. Combined with an ultra fast USB3 port, the Asus X555LA-XX290H 15.6 inch Laptop is fully equipped for data storage with the faster USB port offering up to 10 times faster transfer rates over the USB2.0 standard. Laptops, Tablets & Mobiles > Laptops. Order before 1pm for same day dispatch. Dimensions: 382 x 25.8 x 256 (W x H x D in mm). Graphics card: Intel HD Graphics 4400. Graphics Processing Type: Integrated/On-Board Graphics. Operating System: Windows 8.1. 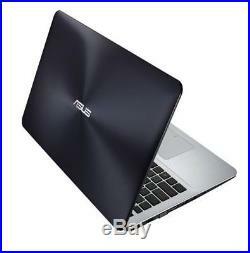 Processor Type: Intel Core i3 4th Gen. Max Resolution: 1366 x 768 Widescreen. Optical Drive: DVD Super Multi. IF/[Customfields:generic:spectype]/Haircare/. This product has no reviews yet, however see what our buyers say about our other products.. Please confirm with our customer service team first before placing the order. For orders delivered via DPD, deliveries will be attempted twice, with a calling card left each time. Large Screen orders will only be attempted on one occasion. Large Screen TVs & Plasma Orders (Over 42 & Plasma). If the item was originally delivered by Initial City Link / DPD / Specialist courier, Electrical-Deals will arrange a FOC collection at your choice of UK Mainland address, we reserve the right to ask you to return the item at your own cost for non-faulty items. All return items must be in their original and unused condition, complete with all accessories supplied and original packaging. Faulty Products - Within 60 Days. If the item was originally delivered by Initial City Link / DPD / Specialist courier, Electrical-Deals will arrange a FOC collection at your choice of UK Mainland address. All return items must be securely packaged in the original packaging and complete with all accessories supplied. If you have elected to receive a replacement, then a swap out will be arranged at any UK mainland address of your choice. Faulty Products - After 60 Days (Excluding cosmetic/accidental damage or customer misuse). You are responsible (including costs) for returning the item to us via a trackable method. Return the item to us at, Electrotec, Manchester Road, Hollinwood, Oldham, OL9 7AA. The item must be securely packaged, preferably in the original packaging using the inserts supplied. We will not be held responsible for any loss or damages that occur whilst in transit. Upon receipt of your item we will provide a FOC repair including any mechanical parts, if in the unlikely event the unit is beyond economical repair we will provide a like for like replacement. When we have repaired your item we will return it to your choice of any UK Mainland address FOC and contact you beforehand. Our FOC repair service excludes cosmetic/accidental damage and customer misuse. The above policies do not affect your statutory rights. You may also be interested in..
Keep in touch for our latest special offers and competitions. 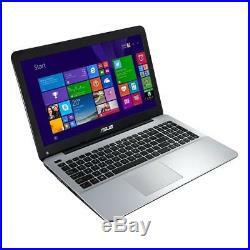 The item "Asus X555LA-XX290H 15.6 Inch Laptop Windows 8.1 Operating System 4GB RAM 1TB HDD" is in sale since Tuesday, March 13, 2018.